A vacation in Sicily turns deadly when young schoolteachers Andrew and his wife Ada find themselves commissioned to solve one the oldest mysteries in the car world. The whereabouts of the priceless 1935 Duesenberg SJ Emmanuel owned by King Victor Emmanuel of Italy has remained undiscovered for decades. Hot on its trail, Andrew and Ada are drawn into a world of high-stakes intrigue. Following the clues along a path of potential landmines, they become immersed in the dangerous landscape of Sicily’s mafia. In a land of high-rollers where the money flows, Andrew and the feisty Ada must contend with a series of riddles, risky complications, and the most notorious crime boss in Sicily. 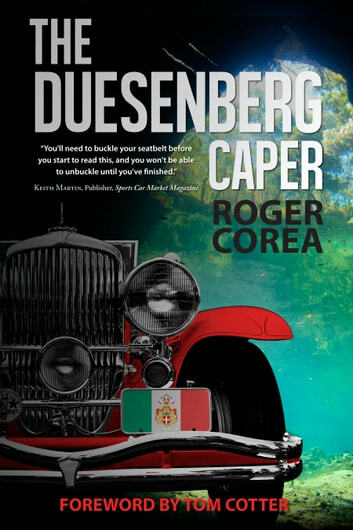 Classic car enthusiasts rejoice—The Duesenberg Caper is lush with the rarest and costliest cars money can’t buy. Roger Corea delves into a wealth of loving detail only a true aficionado could deliver. Shrouded in enigma, his intoxicating Sicilian countryside is a catalyst for this electrifying thriller to unfold.